ICC today on behalf of global business finalized recommendations for World Trade Organization (WTO) member countries to salvage parts of on-going Doha trade negotiations that could boost global GDP by US$960 billion. Remy Rowhani speaks at the ICC World Trade Agenda Summit. Several hundred business leaders and trade experts met for the ICC World Trade Agenda Summit, held on the first day of the ICC WCF 8th World Chambers Congress, the first ever Congress to be held in the Middle East. The four-day Congress in Doha, Qatar is set to gather 1,000 delegates from chambers of commerce, as well as from multinational and small- and medium-sized companies. Delegates met on Monday to give their stamp of approval to a final set of business priorities that would provide a debt-free stimulus to the global economy at a time when governments are struggling to inject growth into their economies. By simplifying customs procedures – through trade facilitation measures – alone, member countries would deliver global job gains of 21 million, with developing countries gaining more than 18 million jobs and developed countries increasing their workforce by three million. 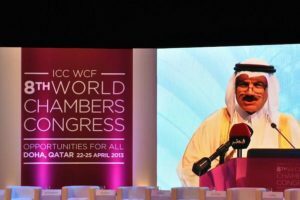 ICC and the Qatar Chamber of Commerce and Industry in March 2012 launched the ICC Business World Trade Agenda in response to calls from WTO members and from G20 leaders for fresh approaches following a 12-year impasse in multilateral trade negotiations. Business recommendations from this event will be delivered to G20 leaders and WTO ministers ahead of the next G20 Summit in Saint Petersburg and the WTO Ministerial Conference in Bali later this year. The Peterson Institute in Washington DC, recently studied ICC’s Business World Trade Agenda, to quantify the potential benefits from the recommendations. It is estimated that the payoff from liberalizing trade in services could generate world trade gains of US$1.1 trillion, which would translate into global employment gains of nine million jobs. At the same time, a meaningful WTO agreement on liberalizing trade in environmental goods, even on a plurilateral basis, could deliver US$10.3 billion of additional exports. The year’s ICC WCF Congress is the biggest international gathering of chambers and their business leaders. The event provides a unique opportunity for interaction among the global community of 12,000 chambers of commerce. “Sharing a common belief that open markets can bring about positive change in the world we have converged in Doha to identify the challenges and opportunities brought about by shifts in the global economy and to help chambers and their business leaders adapt to them,” said Peter Mihok, Chairman, ICC World Chambers Federation.